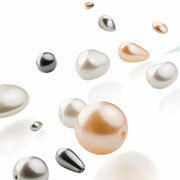 Preciosa Nacre Pearls are a superb imitation of natural or cultivated pearls. They have a crystal ball core which has several coats of nacre applied, using a technology that is very similar to the natural production of pearls. The Nacre Pearls have a gloss on them which makes them indistinguishable from genuine pearls. They are also highly resistant to abrasion, UV radiation, and to alcohol-based perfumes. The production of CRYSTAL NACRE PEARLS by Preciosa involves environment-friendly methods and work procedures that are in accordance with European Community regulations. These 4 mm beads are sold in strands of 31 beads.